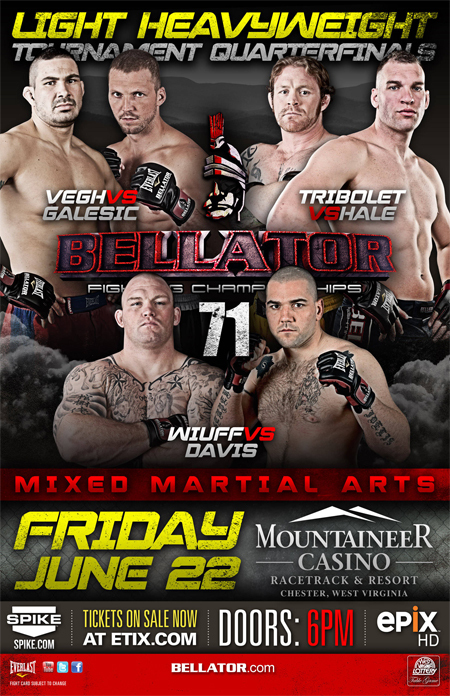 Bellator Fighting Championships is currently on an extended hiatus, but the promotion’s next show takes place June 22nd inside Mountaineer Casino in Chester, West Virginia. “Bellator 71” features all four Light Heavyweight Tournament quarterfinal matchups. Zelg Galesic and Attila Vegh headline the festivities, while Travis Wiuff and Chris Davis serve as the night’s co-main event. Spike.com streams the preliminary bouts live starting at 7PM ET/4PM PT. MTV2 will broadcast the main card beginning at 8PM ET/PT. Fans will also be able to stream the ENTIRE extravaganza LIVE on 5thRound.com.